Crushing & Screening manufacturer Proman Infrastructure Services, exhibited its new range of 250 tph to 400tph high capacity cone crushers PROcone 5010 and PROcone 4510. "This new range is ideal for use in north India due to the region's higher productivity requirements in two stage configuration. They can be used as two-stage with Vertical Shaft Impactors (VSI) and also as three-stage with VSI, cone and screen. 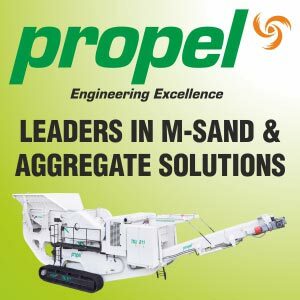 With both the combinations, it can deliver -20 mm of aggregates," informed Managing Director, R S Raghavan. For higher optimization of its crushing plants, PROMAN is offering new mortar production solutions. Made under technical collaboration with Sotecma, its Spanish principal, the mortar plant in 35 and 45 tph variants, can be coupled as an extension to the crushing plant. It comes with bins; the sand drawn from the VSI are sieved and mixed proportionately and added with additives for preparation of the mortar. According to Raghavan, the end-product coming out of the plant can be bagged and commercially sold through cement and building hardware dealers for fixing of tiles, plastering and other jobs. "This will ensure more viability of the crushing plant in the highly competitive Indian aggregates market," he said. PROMAN has recently introduced a dry air classifier, and to meet the requirements for higher capacity crushing, it has launched upto 2.5x8mtr screens.